The interactions between NK cells and dendritic cells (DCs) have been previously demonstrated in vitro. 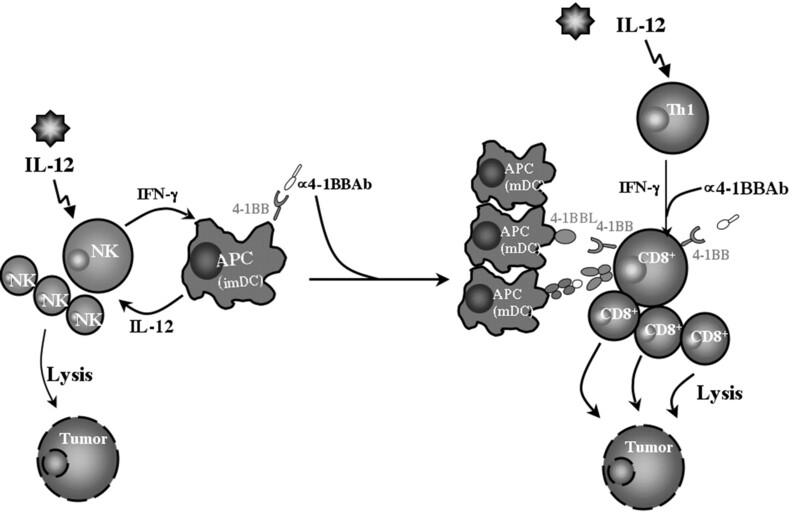 In this report, the in vivo cross-regulation between NK cells and DCs was studied in tumor-bearing mice treated with adenoviral vector expressing IL-12 and agonistic anti-4-1BB Abs. NK cells are essential for both tumor rejection and CTL development in the combination therapy (IL-12 plus anti-4-1BB). The numbers and functional activities of both NK cells and DCs in tumor-infiltrating leukocytes were synergistically increased in the IL-12 plus anti-4-1BB-treated mice compared with treatment with either reagent alone. NK depletion in vivo resulted in a significant decrease in the number of DCs in tumor-infiltrating leukocytes, strongly suggesting that NK cells are involved in the activation and expansion of DCs. The mechanism by which IL-12-activated NK cells regulate DC functions is, in part, mediated through the secretion of IFN-γ that leads to the up-regulation of 4-1BB by DCs. Furthermore, 4-1BB activation in conjunction with IL-12 gene delivery increased tumor infiltration of green fluorescence protein-labeled DCs and enhanced their MHC class II expression. The activation of DCs by NK cells and the subsequent development of antitumoral CTL responses facilitated by 4-1BB-activated DCs may account for the synergistic effects observed in the combination therapy in comparison to adenoviral vector expressing IL-12 or anti-4-1BB treatment alone. Surveillance by the innate immune system plays a critical role in resistance to carcinogenesis. Once established, however, adaptive immunity is essential for the efficient eradication of tumor cells. NK cells and dendritic cells (DCs)3 are the two critical effectors of innate immunity against malignancy. NK cells have been recognized as a functionally distinct subset of leukocytes that serve as the first line of defense against infections and malignancies (1, 2, 3). They appear to be involved not only in the surveillance of malignant cells, but also in the elimination of established solid tissue metastases (4, 5, 6). DCs are sentinels of the immune system. They play an important role as initiators of innate immunity and exhibit unique capacities to prime naive T cells (7, 8, 9, 10). The cytolytic activity of NK cells is regulated by the balance of signals transmitted through cell surface-activating and -inhibitory receptors (11, 12). NK cytotoxicity is enhanced by IL-2 secreted from activated T cells and by DC-derived cytokines such as type I IFN and IL-12 (13, 14). What initiates the activation of NK cells in vivo, however, remains unclear. In a murine tumor model, cytolytic activity and IFN-γ production by resting NK cells were increased substantially by DCs in an in vitro culture system through a contact-dependent mechanism (15), thus providing evidence for “cross-talk” between the effectors of the innate immune system. More recently, a series of reports demonstrated a reciprocal activating interaction between DCs and NK cells in human in vitro model systems (16, 17, 18). Nevertheless, the underlying mechanism and the molecules involved in the functional coordination of DCs and NK cells against tumors in vivo remains undefined. We previously achieved eradication and long-term remission of both hepatic and multiple macroscopic lung metastases in a murine model of metastatic colon carcinoma using a combination of IL-12 gene therapy and systemic delivery of an agonistic Ab against the costimulatory molecule (19) 4-1BB (20). The innate and adaptive immune responses against tumors induced by the combination therapy were synergistic, resulting in an 18-fold reduction of viral dose and yet achieving better efficacy than either reagent alone. Activation of both NK cells and CD8+ T cells was required for the long-term immunity against parental tumor cells. However, the mechanism underlying the synergistic effect of the combination therapy remains to be elucidated. In light of recent discoveries demonstrating the reciprocal activating interaction between NK cells and DCs (16, 17, 18), we hypothesize that NK cells, activated by the intratumoral delivery of the IL-12 gene, can activate DCs, resulting in the up-regulation of 4-1BB expression on DCs that can be further activated by the systemic delivery of agonistic anti-4-1BB Abs. The coordinated activation of NK cells and DCs results in the synergism between the innate and adaptive antitumoral immune responses observed in the combination therapy. In this study, we demonstrate that NK cells regulate the maturation and functions of DCs through an IFN-γ-dependent up-regulation of 4-1BB on DCs. Furthermore, 4-1BB triggering by agonistic anti-4-1BB Abs, in conjunction with intratumoral gene delivery of IL-12, enhanced tumor infiltration and MHC class II expression of adoptively transferred DCs, which resulted in the efficient priming of naive T cells and the development of persistent antitumoral CTL responses. MCA26 is a chemically induced colon carcinoma line derived from BALB/c mice. Metastatic colon carcinoma was established in the liver by intrahepatic implantation of 9 × 104 cells in the left lateral lobe of 8- to 10-wk-old female BALB/c mice. Seven days after implantation, mice with liver tumors measuring 5 × 5 mm2 in diameter were selected and treated with adenoviral vector expressing IL-12 (Adv.IL-12) or control virus (DL312; 7.5 × 109 viral particle/mouse) intratumorally. One hundred micrograms of agonistic monoclonal anti-4-1BB or rat Ig was injected i.p. 8 and 10 days after tumor implantation. BALB/c mice were treated with 5-fluorouridine (5 mg/mouse; Sigma-Aldrich, St. Louis, MO) 5 days before bone marrow (BM) harvesting. BM cells derived from the 5-fluorouridine-treated mice were cultured in IMDM (Cellgro, Herndon, VA) supplemented with 15% FBS, 1.5 × 10−4 M monothiolglycerol (Sigma-Aldrich), 100 ng/ml steel factor, 5% WEHI-conditioned medium (as a source of IL-3), and 10 ng/ml IL-6 (PeproTech, Rocky Hill, NJ) for 48 h, and then transduced with retrovirus murine stem cell virus containing bicistronic Lhx2 and green fluorescence protein (GFP) genes (21). Two weeks later, the conditionally immortalized hemopoietic stem cell line BM-LH2-GFP was established by sorting for GFP+ cells by FACS (BD Biosciences, Mountain View, CA) and maintained in IMDM supplemented with 10% FBS, 1.5 × 10−4 M monothiolglycerol (monothiolglycerol; Sigma-Aldrich), 100 ng/ml steel factor, and 10 ng/ml IL-6. Before adoptive transfer, BM-LH2-GFP cells were cultured in IMDM supplemented with 10% FBS and 3% J558L-GM-CSF conditioned medium (as a source of GM-CSF) for 2 wk. BM-derived DCs were generated as described previously (22). Briefly, bone marrow cells were cultured in complete RPMI 1640 supplemented with 10% FBS, 2 mM l-glutamine, 100 U/ml penicillin, and 100 μg/ml streptomycin in the presence of murine GM-CSF (conditioned medium from J558L-GM-CSF) and recombinant murine IL-4 (20 ng/ml, PeproTech). Nonadherent BM-DCs were harvested on days 5 and day 8. Mature BM-DCs were generated by subsequent culture in the presence of IFN-γ (30 ng/ml; PeproTech) for an additional 24–48 h.
The spleen and tumor were homogenized by pressing between two semifrosted microscope slides. Dissociated cells were strained (70-μm cell strainer; BD Labware, Franklin Lakes, NJ) and washed in HBSS containing 1% FBS. Splenocytes were treated with RBC lysis buffer (Sigma-Aldrich) and washed three times with culture medium. For the preparation of tumor-infiltrating leukocytes (TILs), dissociated cells from homogenized tumor tissues were washed in HBSS containing 1% FBS, resuspended in 5 ml of HBSS, underlayed with 5 ml of Lympholyte-M solution (Cedarlane Laboratories, Hornby, Ontario, Canada), and centrifuged at 1000 × g for 30 min at room temperature. Viable leukocytes in the interface between Lympholyte-M and HBSS were harvested and washed three times with culture medium. Freshly isolated TILs were analyzed for ex vivo NK cytolytic activity without further in vitro stimulation as previously described (19, 23). For CTL activity, splenocytes were harvested 2 wk after the combination therapy and cocultured with irradiated (2000 rad) parental tumor MCA26 cells in the presence of 20 U/ml murine IL-2 for 5 days followed by a 4-h 51Cr release assay. The effector cells were coincubated with 51Cr (NEN, Boston, MA)-labeled MCA26 target cells (150 μCi/3 × 106 cells) for 4 h at 37°C at various E:T cell ratios. After incubation, the radioactivity released in the supernatant was measured using a gamma counter and the percentage of specific lysis was calculated as follows: (experimental release − spontaneous release)/(maximal release − spontaneous release) ×100. PE or FITC direct-conjugated anti-mouse NK (clone DX5; Southern Biotechnology Associates, Birmingham, AL) and anti-mouse CD11c (clone HL3; BD PharMingen, San Diego, CA) were used to stain the NK and DC populations in the TILs, respectively. 4-1BB was detected by a FITC-conjugated anti-4-1BB Ab (clone 2A, a generous gift from Dr. L. Chen, Mayo Clinic, Rochester, MN). Cells were preincubated with 1 μg/106 cells of Fc receptor-blocking Ab (clone 24G2; American Type Culture Collection, Manassas, VA) before staining. MHC class II and costimulatory molecules on DCs were costained with anti-CD11c (FITC labeled) and Abs (PE labeled) against MHC class II and costimulatory molecules, anti-CD40, anti-CD80, and anti-4-1BB ligand or PE-labeled anti-CD11c and FITC-labeled anti-ICAM-1. FACS analysis was performed using a FACScan machine (BD Biosciences) and acquired data was analyzed using CellQuest software (BD Biosciences). For staining of adoptively transferred BM-LH2-GFP cells, allophycocyanin-labeled anti-CD11c and PE-labeled anti-I-A/E were used (eBioscience, San Diego, CA). The hybridoma cell lines GK1.5, 2.43, and R4-6A2 were purchased from American Type Culture Collection for CD4 depletion, CD8 depletion, and IFN-γ neutralization, respectively. Purified anti-NK (DX5) Abs were purchased from BD PharMingen. For in vivo NK depletion, anti-NK Abs or control Ig were administered 6 days and 3 days before the combination therapy and on days 1, 2, 5, 10, and 15 thereafter. Each mouse was given 0.2 mg of Ab by tail vein injection and the efficiency of NK depletion was confirmed by staining with anti-NK Ab 5E6. Purified anti-IFN-γ Abs (0.2–0.3 mg/mouse) were injected via the tail vein the same day as and each subsequent day following virus injection. The residual IFN-γ in serum was measured by ELISA to assure neutralization of IFN-γ. CD4+ and CD8+ T cells were depleted by i.p. injection of 200 μg of Abs every 2 days and the depletion efficiency was confirmed by flow cytometry. The syngeneic JC breast cancer cell line was transduced with adenovirus expressing 4-1BB ligand (Adv.4-1BBL) (24) or control vector DL312 (the E1A-deleted adenovirus without the transgene, generous gift from Dr. T. Shenk, Princeton University, NJ) at a multiplicity of infection of 300. Transduced cells were detached 24 h after infection using Cellstripper (Cellgro) and cocultured with BM-DCs. 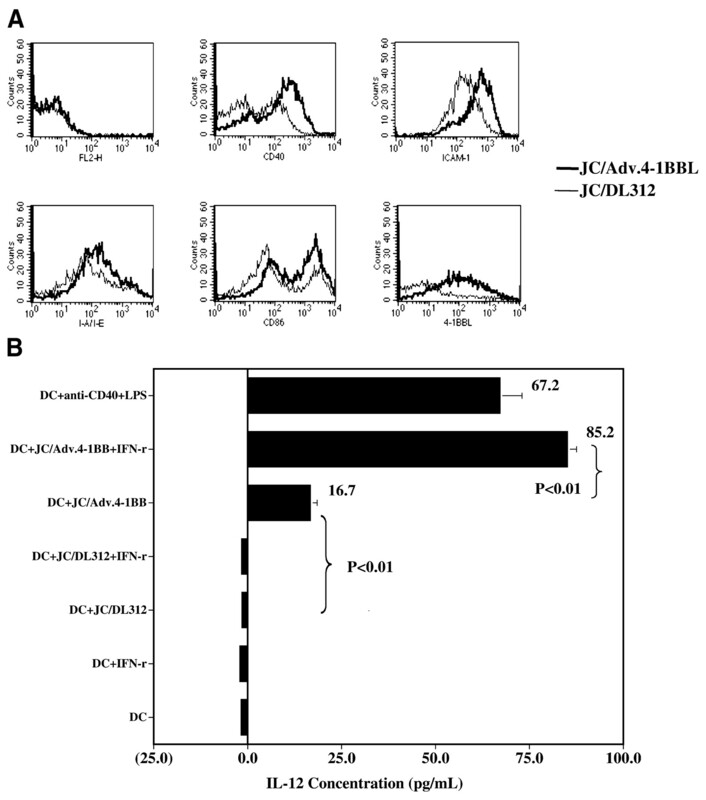 The expression of 4-1BBL on JC cells 48 h after transduction was confirmed by flow cytometry. DCs were depleted from the TILs using a magnetic bead DC isolation kit (Miltenyi Biotec, Auburn, CA) per the manufacturer’s instructions. After depletion, the CD11c+ population in the TILs was <3%, as determined by flow cytometry using a FITC-conjugated anti-CD11c (HL3) Ab (BD PharMingen). Purified T cells derived from CD4 hemagglutinin (HA)-TCR-transgenic mice were used as responder cells. The TILs from various treatment groups were isolated and used as APCs. Purified T cells (2 × 105) were cocultured with graded doses of irradiated (600 rad) APCs in the presence of CD4-specific HA peptide (5 μg/ml) for 5 days and then pulsed with [3H]thymidine for 18 h. Cells were harvested onto Filtermats (catalogue no. 1450-421; Wallac, Turku, Finland), and radioactivity was measured in a 1450 Microbeta scintillation counter (Wallac). Data are presented in cpm (mean ± SD of triplicate cultures). BM-DCs were cocultured with irradiated JC cells transduced with Adv.4-1BBL or DL312. After coculturing for 3 days, DCs were harvested and stained with PE-labeled anti-I-A/E (MHC class II), anti-4-1BBL, or anti-CD86 (BD PharMingen) and biotinylated-CD11c followed by allophycocyanin-labeled streptavidin or control Abs (BD PharMingen). ELISA kits (R&D Systems, Minneapolis, MN) were used to quantify the expression of the cytokines IFN-γ, TNF-α, GM-CSF, and IL-12. Tumor tissues were isolated from the treated mice 5 days after virus injection and homogenized in PBS (0.5 ml) containing 100 mM PMSF (Sigma-Aldrich), 1% (v/v) aprotinin (Sigma-Aldrich), 2 μg/ml leupeptin (Sigma-Aldrich), and 1 μg/ml pepstatin (Sigma-Aldrich). The homogenized tissues were frozen and thawed three times and the lysate was clarified by centrifugation in a microcentrifuge for 5 min at maximum speed. The supernatant was appropriately diluted for the ELISA and the concentrations of IFN-γ, TNF-α, and GM-CSF were measured. Tumor tissues from untreated mice were used as control. The data are presented as the mean and SD of three individual animals from each group at a concentration of nanogram per gram tumor weight. In vitro secretion of IL-12 by 4-1BBL-stimulated DCs was performed by coculturing 1 × 105/well (96-well plate) BM-DCs with 1 × 104/well Adv.4-1BBL or control viral vector DL312-transduced JC cells in 200 μl of complete medium, with or without IFN-γ (30 ng/ml). Supernatants were collected for ELISA 48 h after coculture. We have previously shown that agonistic anti-4-1BB Ab acted synergistically with Adv.IL-12 gene therapy to induce a persistent antitumor immune response that resulted in long-term survival of tumor-bearing mice (19). However, the detailed mechanism underlying this synergistic therapeutic effect has not been studied. NK cells are the first line of defense against infections and malignancies. Thus, we determined whether the cytolytic activity and the number of NK cells were increased with the combination of IL-12 gene therapy and anti-4-1BB costimulation. TILs were isolated from treated mice (four mice per group). NK direct ex vivo cytolytic assay and flow cytometric analysis of NK marker (DX5) were performed. Consistent with IL-12’s NK activation activity, the ex vivo cytolytic activity of TILs from IL-12 plus 4-1BB Ab-treated animals was significantly higher than in the animals treated with either reagent alone (Fig. 1⇓A). This direct cytolytic activity was ablated by NK Ab-mediated complement lysis of effector cells, but not by control Ab, indicating that the direct cytolytic activity was mediated by NK cells. The number of NK cells in the TILs derived from mice treated with Adv.IL-12 was higher than that of the control treatment group (Fig. 1⇓B). In agreement with the NK cytolytic activity, a synergistic increase in the number of NK cells was observed in the TILs derived from the animals in the IL-12 plus anti-4-1BB treatment group when compared with those from either the IL-12 or anti-4-1BB treatment group. A synergistic increase in both the cytolytic activity and number of NK cells induced by the Adv.IL-12 plus anti-4-1BB combination therapy. A, NK direct cytolytic activity. Leukocytes were isolated and combined from the tumors of five mice per group at day 2 after treatment and analyzed for direct cytolysis against 51Cr-labeled parental MCA26 tumor target cells. The anti-pan NK or control rat Ig Ab plus complement was used for NK cell depletion. B, Immunostaining of NK cells in TILs. TILs were isolated, combined from four mice per treatment group, and stained with PE-labeled anti-NK Ab (DX5). The number of DX5+ cells per mouse is shown. The data presented are from a representative of two independent experiments. To critically evaluate the role of NK cells in tumor regression induced by IL-12 plus anti-4-1BB combination therapy, tumor-bearing mice were depleted of NK cells with anti-NK Ab (pan NK marker, clone DX5) before treatment and the tumor mass was assessed 20 days after treatment. As shown in Fig. 2⇓A, the residual tumors were barely detectable in the treated mice receiving control Ig. In contrast, the tumor size in NK-depleted animals was significantly larger than that in the control group (p < 0.01, Student’s t test), suggesting that NK cells play an important role in retarding tumor growth at the early phase of the combination therapy. NK cells are required for hepatic tumor regression and CTL development with combination therapy. The day before combination treatment (Adv.IL-12 plus anti-4-1BB administration), tumor-bearing mice were depleted of NK cells with anti-NK (DX5) Ab as described in Materials and Methods. A, NK-dependent tumor regression. Tumor mass was assessed 20 days after combination therapy. All of the NK-depleted mice (n = 4) developed large tumors as compared with control Ig-treated animals (n = 4, p < 0.01, unpaired t test). B, Impaired CTL development in NK-depleted mice treated with the combination therapy. Splenocytes isolated from control or NK-depleted groups were analyzed for CTL activity after a 5-day coculture with irradiated parental tumor cells in the presence of IL-2. Significant cytolytic activity against 51Cr-labeled parental MCA26 tumor target cells was observed in combination-treated mice (n = 4), but not in NK-depleted mice receiving the same combination therapy (n = 4) (p < 0.01, unpaired t test). Agonistic anti-4-1BB Ab was shown to activate CD8+ T cells and enhance CTL responses (25, 26). Our previous report showed a significant tumor infiltration by CD8+ T cells in mice treated with Adv.IL-12 plus anti-4-1BB (19, 24). Furthermore, CD8+ T cells were necessary for maintaining the long-term antitumor immunity against the parental tumor cells, suggesting CD8+ T cell participation in the antitumor responses mediated by the combination therapy. To determine whether normal CTL development occurred in the absence of NK cells, splenocytes from the IL-12 plus anti-4-1BB-treated mice depleted of NK cells were cocultured with irradiated MCA26 cells for 5 days and the CTL activities were analyzed. The IL-12 plus anti-4-1BB-treated mice receiving control Ig exhibited a normal cytolytic response against MCA26 cells (Fig. 2⇑B). The cytolytic activity was inhibited by preincubation of effector cells with anti-CD3 Abs, suggesting that the cytolysis was mediated by CD3+ T cells (data not shown and Ref. 19). Surprisingly, no detectable CTL activity was observed in the NK-depleted mice that received the combination therapy. These results indicate that both tumor regression and antitumor CTL development in the combination-treated mice are NK dependent. Efficient presentation of tumor Ags is essential to the development of antitumor CTL responses. To determine whether DCs were also involved in the synergistic effect of the combination therapy, the DC population in TILs derived from treated mice was analyzed. As shown in Fig. 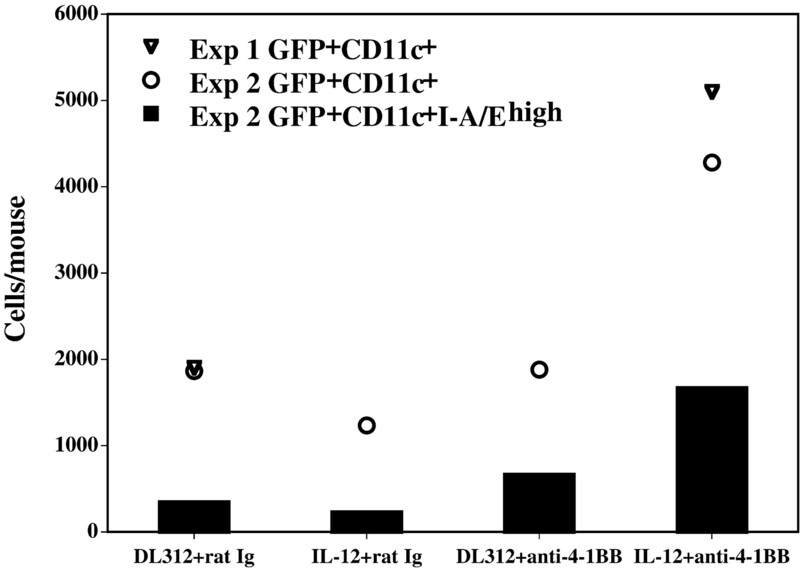 3⇓A, the number of CD11c+ cells was increased significantly in the IL-12 plus anti-4-1BB-treated mice (18.7 × 104/mouse in IL-12 plus anti-4-1BB group; 8.4 × 104/mouse in IL-12 plus rat Ig group; 2.8 × 104/mouse in DL312 plus anti-4-1BB group; and 5.8 × 104/mouse in DL-12 plus rat Ig group). More importantly, a higher percentage and absolute number of CD11c+CD80+ and CD11c+I-A/Ehigh cells were observed in the TILs derived from the IL-12 plus anti-4-1BB-treated group (Fig. 3⇓B), indicating that a mature DC population was present in the combination-treated animals. NK-dependent synergistic increase in the number and Ag-presenting activity of CD11c+ DCs in the combination therapy. A, Quantitation of CD11c+ DCs in TILs. TILs were isolated from mice 4 days after various treatments and stained with PE-labeled rat anti-mouse CD11c. The IL-12 plus 4-1BB-treated group showed a significant increase of CD11c+ cells in the TILs when compared with DL312 plus rat Ig, DL312 plus anti-4-1BB, or IL-12 plus rat Ig-treated groups (∗, p < 0.01; ANOVA). The data are presented as the average of three independent experiments. B, Phenotype of CD11c+ DCs in TILs. The cell number and percentage of MHC class II (I-A/E) and CD80 on CD11c+ DCs in TILs derived from various treatment groups were analyzed by flow cytometry. The percentage and number of double-positive cells are shown. C, A significant increase in Ag presentation activity of TILs in mice treated with the combination therapy. Irradiated TILs were used as APCs in a CD4 HA-specific TCR-transgenic T cell proliferation assay. D, Ag-presenting activity in TILs is mediated by CD11c+ cells. TILs were isolated from IL-12 plus anti-4-1BB-treated mice and tested for APC function with or without in vitro CD11c depletion with anti-CD11c-conjugated magnetic microbeads. E, NK-dependent increase of CD11c+ DC population in TILs. Mice were in vivo depleted of NK cells 2 days before IL-12 plus anti-4-1BB combination therapy. DL312 plus rat Ig group served as a negative control. TILs were isolated at day 4 after treatment, stained with PE-labeled anti-CD11c, and analyzed by flow cytometry. Similar results were obtained in repeated independent experiments. To evaluate the functional significance of DCs in the tumors of treated mice, the Ag presentation activity of TILs was analyzed. Purified T cells derived from CD4 HA-TCR-transgenic mice were cocultured with irradiated TILs in the presence of CD4 HA-specific peptides and [3H]thymidine incorporation was analyzed. Only the TILs isolated from the IL-12 plus 4-1BB-treated mice significantly stimulated the HA peptide-mediated T cell proliferation when compared with control vector or single reagent treatment groups (Fig. 3⇑B). To further identify the cell type in TILs responsible for Ag presentation, in vitro depletion of CD11c+ cells was performed followed by HA peptide-mediated cell proliferation assay. As shown in Fig. 3⇑C, the Ag-presenting function was decreased dramatically after CD11c depletion, indicating that the majority of Ag presentation activity in the TILs was mediated by CD11c+ DCs. We observed a significant increase in the number and functional activity of DCs in tumor-bearing mice treated with the IL-12 plus anti-4-1BB combination therapy. Furthermore, CTL activities in the IL-12 plus anti-4-1BB-treated mice were abolished completely by in vivo NK depletion. The impaired CTL response in the NK-depleted mice might be attributed to the absence of tumor lysis by NK cells, thereby resulting in a lack of presentable tumor Ags. Alternatively, NK cells may play an essential role in the regulation of DC activation and their functions. To determine whether the observed increase in the number and Ag presentation activity of DCs was NK dependent, in vivo NK depletion in mice was performed before the IL-12 plus anti-4-1BB therapy and the number of CD11c+ DCs in the TILs analyzed. Interestingly, a significant decrease in CD11c+ cells was observed in the combination (IL-12 plus anti-4-1BB)-treated mice with in vivo NK depletion, suggesting that NK cells were essential in the increase of DC number in the combination-treated mice (Fig. 3⇑D). Recent evidence supports an in vitro cell-cell contact interaction between NK cells and DCs (16, 17, 18). However, the molecule(s) involved in this interaction has not yet been identified. Activated NK cells secrete multiple cytokines, which may be important in the regulation of DC activation and function. To determine which cytokines were involved in the synergistic effect of the IL-12 plus anti-4-1BB combination therapy, the cytokine profile in tumor tissues from treated mice was analyzed. As shown in Fig. 4⇓A, the level of IFN-γ was significantly higher in the combination treatment group (51.13 ± 7.11 ng/g tumor tissue) than in animals treated with IL-12 (≤20.83 ± 3.98 ng/g tumor tissue) or 4-1BB alone (6.88 ± 7.91 ng/g tumor tissue). However, no significant difference in the level of TNF-α or GM-CSF was detected (data not shown). NK cells appeared to be the major source of IFN-γ, since the in vivo depletion of NK cells, but not CD4+ or CD8+ T cells, reduced the serum level of IFN-γ significantly (Fig. 4⇓B, p < 0.03 for NK depletion, p > 0.1 for CD4 or CD8 depletion). NK-dependent synergistic increase in IFN-γ and its effect on the number and the Ag presentation function of DCs. A, A synergistic increase in IFN-γ induced by the combination therapy. The level of IFN-γ in the tumor tissue (n = 3) was measured 5 days after virus injection as described in Materials and Methods. The level of IFN-γ in the tumors derived from mice treated with the combination therapy is significantly higher than those derived from control or single reagent treatment groups (∗, p < 0.01; ANOVA). B, NK-dependent increase of IFN-γ level in the serum of mice receiving the combination treatment. The serum from combination-treated mice with various leukocyte subset depletions before the treatment was harvested at day 4 after treatment and the IFN-γ concentration measured. C, IFN-γ is essential for the increase of Ag-presenting activity induced by the combination therapy. Neutralization of IFN-γ in vivo was performed before and during the combination treatment. The TILs were isolated at day 4 after the combination treatment and used as APCs in a CD4 HA-specific TCR-transgenic T cell proliferation assay. The Ag presentation activity was significantly reduced in the combination-treated group with in vivo IFN-γ neutralization (p < 0.01, repeated measures ANOVA). D, In vivo IFN-γ neutralization reduces the CD11c+ population in TILs derived from mice treated with the combination therapy. The TILs were combined from four treated mice per group, stained with PE-labeled anti-CD11c Ab, and analyzed by flow cytometry. The number of CD11c+ cells per mouse in the TILs is presented. The CD11c+ cell number in TILs was reduced significantly by in vivo IFN-γ neutralization (p < 0.01, paired t test). We further tested whether the observed NK-dependent increase in the number of DCs was mediated by IFN-γ in mice treated with the combination therapy. Interestingly, APC function of TILs isolated from the IL-12 plus 4-1BB-treated group decreased significantly with the in vivo neutralization of IFN-γ before and during the combination therapy (p < 0.01; repeated measures ANOVA, Fig. 4⇑C). To determine whether the decreased Ag presentation activity was due to the reduction of the DC population, the numbers of CD11c+ cells in the TILs derived from the combination therapy-treated mice with or without in vivo IFN-γ neutralization were analyzed by flow cytometry. The number of CD11c+ DCs was significantly reduced in the mice treated with the neutralization Ab against IFN-γ (p < 0.01; paired t test, Fig. 4⇑D). These results indicate that IFN-γ is required for the increase of DC number and Ag presentation function in mice treated with the combination therapy. Neutralization of IFN-γ with specific Abs reduced the number of CD11c+ DCs in the IL-12 plus anti-4-1BB-treated mice in comparison to the number observed in mice treated with Adv.IL-12 alone (Figs. 3⇑A and 4⇑D), suggesting that the effect of NK-secreted IFN-γ on the number and function of DCs may be mediated by 4-1BB activation through the binding of the agonistic anti-4-1BB Ab. We further hypothesized that 4-1BB expression on DCs could be up-regulated by IFN-γ and that the function of DCs could be enhanced by 4-1BB costimulation. To test this hypothesis, the level of 4-1BB expression on CD11c+ DCs in the tumors of mice treated with control vector DL312 or Adv.IL-12 was analyzed by flow cytometry. In mice treated with control vector DL312, 35.0% of CD11c+ DCs in TILs were stained with anti-4-1BB. Interestingly, Adv.IL-12-treated tumor-bearing mice had much higher 4-1BB expression on CD11c+ cells in TILs (50.4%) compared with control vector-treated mice (Fig. 5⇓A). This up-regulation of 4-1BB in IL-12-treated animals was IFN-γ dependent, as 4-1BB expression on CD11c+ DCs derived from IL-12-treated mice was reduced from 54 to 6.6% in the TILs by in vivo neutralization of IFN-γ with specific Abs before virus injection (Fig. 5⇓A). However, 4-1BB expression on T cells was not significantly affected by the IL-12 adenoviral gene delivery (Fig. 5⇓B). These results suggest that intratumoral IL-12 gene delivery results in the up-regulation of 4-1BB expressions on DCs through IFN-γ secreted by the IL-12-activated NK cells. IFN-γ-dependent 4-1BB up-regulation of CD11c+ cells by the intratumoral IL-12 gene delivery. A, The 4-1BB expression by CD11c+ DCs in TILs derived from mice treated with vector DL312 (upper panel), Adv.IL-12 (middle panel), or Adv.IL-12 with in vivo IFN-γ neutralization (lower panel). IFN-γ neutralizing Ab (clone R4-6A2; American Type Culture Collection) or control rat Ig was injected i.v. the same day as the injection of recombinant virus and every day thereafter. The TILs derived from the tumors (combined from three mice per treatment group) were stained with PE-labeled anti-CD11c and FITC-labeled anti-4-1BB and analyzed with flow cytometry. The results shown are the analysis of 4-1BB expression gated on CD11c+ cells. B, No significant increase in 4-1BB expression by T cells from mice 7 days after treatment. The leukocytes from spleen and lymph nodes of treated mice were stained with PE-labeled anti-CD3 and FITC-labeled anti-4-1BB and the analysis gated on CD3+ cells was performed. The results are from a representative of three independent experiments. Although agonistic mAbs against 4-1BB has been shown to costimulate proliferation and cytokine secretion in T cells, the functional significance of the up-regulation of 4-1BB expression on DCs induced by IL-12 is yet to be determined. To address whether agonistic anti-4-1BB Ab could enhance the maturation and migration of DCs into the tumor, conditionally immortalized hemopoietic cells (BM-LH2-GFP), which had been cultured in the presence of GM-CSF for 2 wk to induce DC development, were injected i.v. into tumor-bearing mice before combination therapy. The use of DCs derived from GFP-labeled hemopoietic stem cells enables us to follow the migration and maturation of DCs in recipient mice. The TILs were prepared from the tumors of two treated mice per group on day 4 after the adoptive transfer, stained with anti-CD11c (allophycocyanin labeled) and anti-I-A/E (PE labeled), and analyzed by flow cytometry. GFP+ cells were gated and analyzed for the expression of CD11c and I-A/E. As shown in Fig. 6⇓, a significant higher number of GFP+CD11c+ cells was present in the TILs derived from mice treated with the IL-12 plus anti-4-1BB combination therapy than in those derived from other treatment groups. More importantly, a higher level of I-A/E expression on GFP+CD11c+ cells was observed in the TILs isolated from mice treated with the combination therapy when compared with either treatment alone or control treatment. The results suggest that the IL-12 plus anti-4-1BB combination therapy enhances the tumor infiltration and MHC class II expression of DCs in treated mice. Migration and maturation of DCs induced by the IL-12 and anti-4-1BB combination therapy. Eight million BM-LH2-GFP cells, after stimulation with GM-CSF for 2 wk, were injected i.v. into tumor-bearing mice followed by the combination therapy. Four days after adoptive transfer, TILs were stained with allophycocyanin-labeled anti-CD11c and PE-labeled anti-I-A/E or control Abs. CD11c and I-A/E expression on GFP+ cells were analyzed. The effect of 4-1BB costimulation on DC differentiation was examined in an in vitro culture system in which BM-DCs were cocultured with a syngeneic breast tumor cell line, JC, transduced with control vector or Adv.4-1BBL. Forty-eight hours after the coculture, cells were harvested and stained with anti-CD40, anti-ICAM-1, anti-MHC class II, anti-CD86, or anti-4-1BBL. Although the majority of BM-DCs constitutively expresses MHC class II and costimulatory molecules, (CD40, ICAM-1, CD86, and 4-1BBL), in the coculture with control vector (DL312)-transduced JC cells, the expression of these molecules was further up-regulated by coculturing with JC cells expressing 4-1BB ligand (Fig. 7⇓A). Moreover, 4-1BB ligand-engaged DCs secreted a significantly higher level of IL-12 (Fig. 7⇓B). More importantly, the IL-12 secretion by 4-1BBL-engaged DCs was further enhanced in the presence of IFN-γ, consistent with our observation that 4-1BB expression on DCs was significantly increased by IFN-γ in vitro (data not shown) and by IL-12 gene delivery in vivo through an IFN-γ-dependent pathway (Fig. 5⇑). These results indicate that 4-1BB engagement on DCs is critically important for the maturation and activation of DCs. DC maturation and IL-12 secretion enhanced by 4-1BB engagement. BM-DCs were cocultured with transduced JC cells for 48 h as described in Materials and Methods. A, Enhanced expression of MHC class II and costimulatory molecules by DCs upon 4-1BB triggering. Nonadherent cells from the coculture were stained with anti-MHC class II and Abs against MHC class II and costimulatory molecules as described in Materials and Methods. The CD11c+ cells were gated and further analyzed. The thin line represents the staining of DC cells cocultured with control vector-transduced JC cells and the thick line represents the DCs stimulated with Adv.4-1BBL-transduced JC cells. B, IL-12 secretion by DC is enhanced by 4-1BB engagement and IFN-γ. Supernatants from the coculture were analyzed for IL-12 (p70) concentration by ELISA. Data are presented as the mean and SD of triplicate wells. The result shown is a representative of three independent experiments. Innate immune effector cells play a pivotal role in dictating adaptive immune responses. Among innate effectors, the DC population is the sensor of microbial infections and the cornerstone between innate and adaptive immunity. Toll-like receptors play a major role in pathogen recognition by DCs (27). Stimulation of Toll-like receptors by microbial products results in the induction of inflammatory cytokines and DC maturation. However, in nonmicrobial manifestations, such as tumorigenesis, transplantation, and autoimmunity (atopy), other mechanisms are required to trigger DC maturation directly. In immune surveillance against malignant cells, NK cells may convey stress signals to DCs that, upon activation and maturation, can initiate an adaptive immune response efficiently through the expression of costimulatory molecules, such as CD80 and CD86. Our previous study demonstrated that the combination of intratumoral IL-12 gene delivery and anti-4-1BB Abs resulted in synergistic effects against tumor progression, eradicated existing distal pulmonary lung metastases, and achieved long-term cure of tumor-bearing mice (19). Both NK and CD8+ T cells were activated and were essential for the observed synergism between innate and adaptive immunity. Our current study shows that the antitumor CTL response is NK dependent in the combination therapy. In vivo depletion of NK cells before combination therapy completely eliminated the CTL response against tumor cells. This observation led us to investigate the mechanism by which NK cells affect the development of CTL responses against tumor cells. Interestingly, both the number and functions of DCs were significantly increased in mice treated with the combination therapy when compared with mice receiving either reagent alone. In vivo depletion with anti-NK1.1 before the therapy resulted in the decrease in both the number and the Ag presentation function of DCs, suggesting that NK or NKT cells, or both, could regulate the activation and function of DCs. However, a synergistic increase in the number of CD11c+ DCs in TILs was observed in tumor-bearing NKT-deficient mice (CD1 knockout; Ref. 28) treated with the combination therapy (data not shown), suggesting that NKT cells are not involved in the increase of DC number. The level of IFN-γ, a Th1 cytokine that is important for cell-mediated immunity, was synergistically increased in mice treated with the combination therapy (Fig. 4⇑A). NK cells appeared to be the major source of IFN-γ secretion because in vivo NK depletion before treatment drastically decreased the level of IFN-γ in the serum. Furthermore, in vivo neutralization of IFN-γ significantly reduced the cell number and the Ag presentation function of DCs. We then analyzed the 4-1BB expression by DCs in treated tumor-bearing mice and found that intratumoral IL-12 gene delivery enhanced the 4-1BB expression by DCs in TILs, lymph nodes, and spleen. In vivo neutralization of IFN-γ before the gene delivery ablated 4-1BB up-regulation on DCs (Fig. 5⇑B), suggesting that IFN-γ was responsible for the increase in 4-1BB expression by DCs. 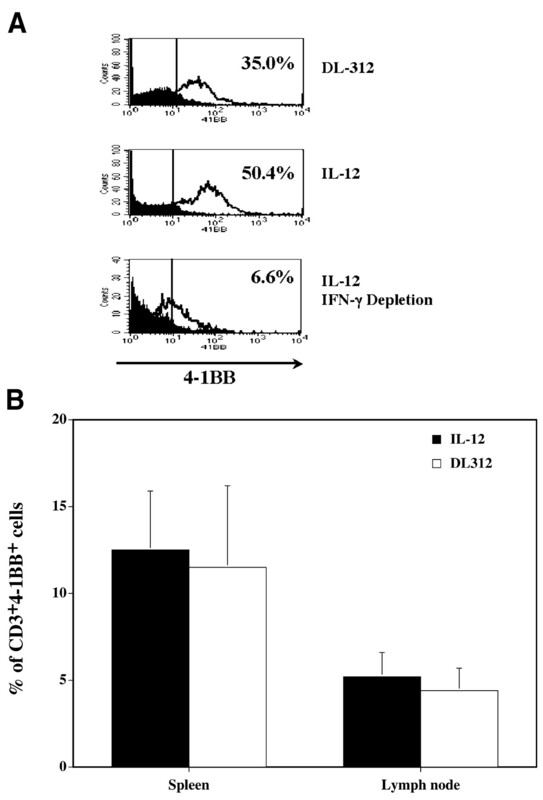 The up-regulation of 4-1BB expression by IL-12 through the IFN-γ-dependent pathway appeared to be more efficient for DCs because no increase in 4-1BB expression by T cells was observed (Fig. 5⇑C). Taken together, these results suggest that NK cells activated by intratumoral IL-12 gene delivery regulate the 4-1BB expression by DCs. Interestingly, neutralization of IFN-γ not only reduced the number of DCs in mice treated with the combination therapy to the same level as that in mice treated with Adv.IL-12 alone (Figs. 3⇑A and 4⇑D), but also ablated 4-1BB up-regulation on DCs (Fig. 5⇑B). Hence, the synergistic increase in DC number and function appears to be mediated through the up-regulation of 4-1BB on DCs by NK-produced IFN-γ and the subsequent activation of DCs by agonistic anti-4-1BB Abs. Two studies reported that freshly isolated DCs constitutively expressed low levels of 4-1BB (29, 30). Engagement of 4-1BB by 4-1BB ligand-transfected cells or by agonistic anti-4-1BB Abs increased the secretion of IL-6 and IL-12 as well as the alloreactivity of DCs. The effect of 4-1BB engagement on DC proliferation and maturation, however, has not been thoroughly investigated. In this report, we found that 4-1BB expression by DCs was up-regulated by intratumoral delivery of the IL-12 gene. More importantly, the engagement of 4-1BB not only enhanced the surface expression of MHC class II and costimulatory molecules (ICAM-1, CD40, CD86, and 4-1BB ligand) by DCs (Fig. 7⇑) but also increased the proliferation and tumor infiltration of DC (Fig. 6⇑). 4-1BB costimulation on DCs may be a novel signaling pathway for inducing the proliferation, maturation, and migration of DCs that has not been demonstrated before. Recently, an in vitro reciprocal interaction through a cell contact-dependent pathway between DCs and NK cells was demonstrated in human model systems (16, 17, 18). However, the in vivo interactions between these two innate effectors and the underlying mechanisms have not been investigated. In this report, we establish that, in tumor-bearing mice treated with the combination therapy of Adv.IL-12 and agonistic anti-4-1BB, IL-12-activated NK cells up-regulated 4-1BB expression by DCs through an IFN-γ-dependent pathway and that triggering 4-1BB on DCs by agonistic Abs resulted in enhanced tumor infiltration and maturation of DCs. The observed NK dependence of CTL development in the combination therapy is, at least in part, attributed to the increased number and maturation of DCs induced by IL-12-activated NK cells. IFN-γ, produced by IL-12-activated NK cells, is required for the increase in the cell number and Ag presentation activity of DCs in the combination treatment group as in vivo IFN-γ neutralization significantly reduced both the number and APC function of DCs (Fig. 4⇑). Interestingly, in vivo NK depletion resulted in a more profound effect on the DC number when compared with in vivo neutralization of IFN-γ (10-fold vs 2-fold reduction, Figs. 3⇑E and 4⇑D), implying that other mechanisms are involved in the regulation of DC function by NK cells. Our results suggest that the in vivo interaction between NK cells and DCs may use multiple pathways, including cytokines and a contact-dependent mechanism as demonstrated in human in vitro model systems (16, 17, 18). 4-1BB was originally shown to be expressed by activated T cells, NK, and NKT cells (31), and more recently to be constitutively expressed by T regulatory cells, monocytes, neutrophils, and DCs (30, 31, 32, 33, 34, 35, 36), while 4-1BBL is expressed mainly on activated APCs, such as DCs, B cells, and macrophages (31). The expression pattern of 4-1BB and its ligand suggests the role of 4-1BB signaling in multiple steps of both innate and adaptive immune responses. Administration of anti-4-1BB Abs leads to the eradication of established tumors in selected tumor models (25, 26, 29, 37, 38). However, several poorly immunogenic tumors, once established as solid tumors or metastases, are refractory to anti-4-1BB treatment (19, 23, 39). 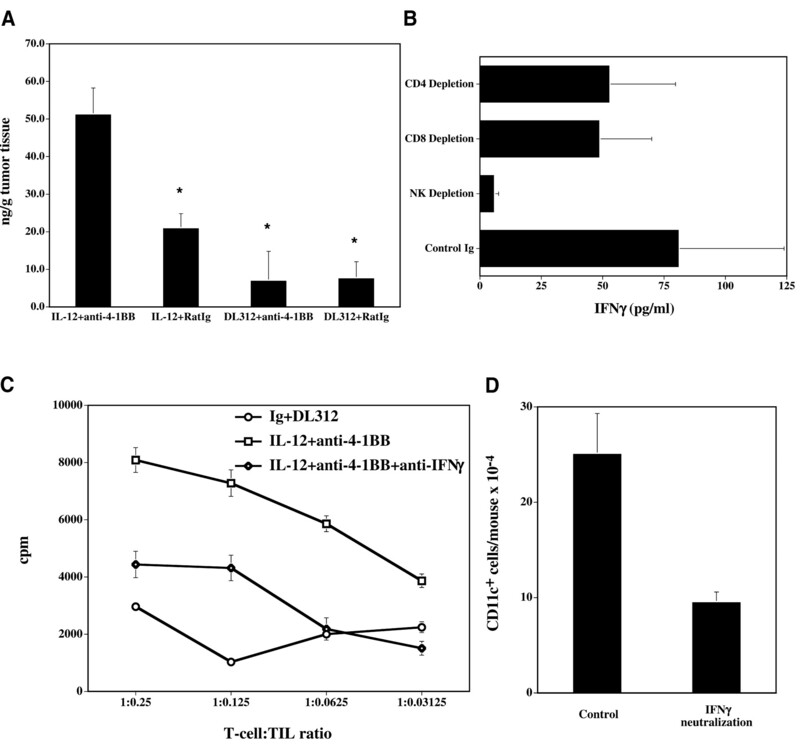 Breaking CTL ignorance by immunization with tumor peptides is required for anti-4-1BB treatment to induce CTL responses, leading to the regression of established C3, TC-1, and B16-F10 tumors (39, 40). In our model of metastatic MCA26 colon carcinoma in liver, anti-4-1BB treatment alone induces a transient CTL response (19). Only in combination with intratumoral delivery of Adv.IL-12 can anti-4-1BB induce a persistent CTL response and result in long-term survival of treated mice. In this report, we show a significant increase in the number of mature functional CD11+ DCs in tumors treated with the IL-12 plus anti-4-1BB combination therapy (Fig. 3⇑). The mature DCs may present tumor Ags, released from tumors killed by IL-12-activated NK cells, to tumor-specific CTL. The combination of Ag stimulation and 4-1BB costimulation results in the development of a persistent CTL response against tumors. Based on the results from this study, a model for the interaction between innate and adaptive immune effector cells in tumor-bearing mice treated with the combination therapy was proposed and is depicted in Fig. 8⇓. In this model, the intratumoral IL-12 gene delivery initiates the activation of NK cells, leading to the secretion of IFN-γ. Subsequently, DCs are activated by IFN-γ and by a cell contact-dependent mechanism, resulting in the up-regulation of 4-1BB expression. Upon triggering by the agonistic Ab, 4-1BB-expressing DCs undergo expansion, migration, and maturation, resulting in the secretion of IL-12 and the expression of costimulatory molecules. Furthermore, engagement of 4-1BB delivers a stimulatory signal, enabling DCs to reciprocally interact with IL-12-activated NK cells through an unidentified pathway. The reciprocal activating interaction between DCs and NK cells leads to the observed synergistic increase in the cell numbers and the functions of both DCs and NK cells in the combination therapy with IL-12 plus agonistic anti-4-1BB as compared with either treatment alone. In addition to priming innate immunity by triggering NK effector functions, mature DCs prime naive T cells efficiently. The activated T cells undergo clonal expansion and differentiation, resulting in enhanced Th1 and CTL responses in the presence of IL-12 and IFN-γ. The synergistic effect reflected by NK effector functions, Ag presentation capabilities and tumor infiltration of DCs, and persistent antitumor CTL responses are attributed to the reciprocal activation between NK cells and DCs and the coordinate activation of innate and adaptive immunity in the combination therapy of IL-12 plus 4-1BB activation. We thank Dr. Lieping Chen for providing the anti-4-1BB hybridoma (2A), Drs. Drew M. Pardoll, Savio L. C. Woo, Lieping Chen, and Alice I. Sato for helpful discussion, and Zhan Liu for technical assistance. ↵1 This work was supported in part by the Sharp Foundation and Grants RO1 CA-70337 and CA84404 (to S.-H.C.) from the National Cancer Institute. ↵3 Abbreviations used in this paper: DC, dendritic cell; Adv.IL-12, adenoviral vector expressing IL-12; GFP, green fluorescence protein; BM, bone marrow; TIL, tumor-infiltrating leukocyte; HA, hemagglutinin; Adv.4-1BBL, adenovirus expressing 4-1BB ligand. Biron, C. A., K. B. Nguyen, G. C. Pien, L. P. Cousens, T. P. Salazar-Mather. 1999. Natural killer cells in antiviral defense: function and regulation by innate cytokines. Annu. Rev. Immunol. 17:189. Soloski, M. J.. 2001. Recognition of tumor cells by the innate immune system. Curr. Opin. Immunol. 13:154. Diefenbach, A., E. R. Jensen, A. M. Jamieson, D. H. Raulet. 2001. Rae1 and H60 ligands of the NKG2D receptor stimulate tumour immunity. Nature 413:165. Yasumura, S., W. C. Lin, H. Hirabayashi, N. L. Vujanovic, R. B. Herberman, T. L. Whiteside. 1994. Immunotherapy of liver metastases of human gastric carcinoma with interleukin 2-activated natural killer cells. Cancer Res. 54:3808. Kim, S., K. Iizuka, H. L. Aguila, I. L. Weissman, W. M. Yokoyama. 2000. In vivo natural killer cell activities revealed by natural killer cell-deficient mice. Proc. Natl. Acad. Sci. USA 97:2731. Shingu, K., A. Helfritz, S. Kuhlmann, M. Zielinska-Skowronek, R. Jacobs, R. E. Schmidt, R. Pabst, S. von Horsten. 2002. Kinetics of the early recruitment of leukocyte subsets at the sites of tumor cells in the lungs: natural killer (NK) cells rapidly attract monocytes but not lymphocytes in the surveillance of micrometastasis. Int. J. Cancer 99:74. Banchereau, J., R. M. Steinman. 1998. Dendritic cells and the control of immunity. Nature 392:245. Inaba, K., R. M. Steinman. 1985. Protein-specific helper T-lymphocyte formation initiated by dendritic cells. Science 229:475. Schuler, G., R. M. Steinman. 1985. Murine epidermal Langerhans cells mature into potent immunostimulatory dendritic cells in vitro. J. Exp. Med. 161:526. Inaba, K., G. Schuler, M. D. Witmer, J. Valinksy, B. Atassi, R. M. Steinman. 1986. Immunologic properties of purified epidermal Langerhans cells: distinct requirements for stimulation of unprimed and sensitized T lymphocytes. J. Exp. Med. 164:605. Moretta, A., C. Bottino, M. Vitale, D. Pende, C. Cantoni, M. C. Mingari, R. Biassoni, L. Moretta. 2001. Activating receptors and coreceptors involved in human natural killer cell-mediated cytolysis. Annu. Rev. Immunol. 19:197. Lanier, L. L.. 2001. On guard–activating NK cell receptors. Nat. Immunol. 2:23. Windhagen, A., D. E. Anderson, A. Carrizosa, R. E. Williams, D. A. Hafler. 1996. 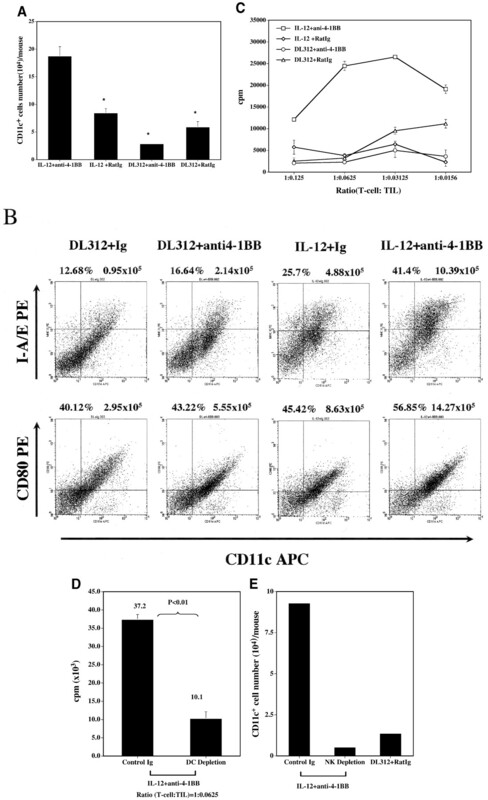 IL-12 induces human T cells secreting IL-10 with IFN-γ. J. Immunol. 157:1127. Sousa, C. R., S. Hieny, T. Scharton-Kersten, D. Jankovic, H. Charest, R. N. Germain, A. Sher. 1997. In vivo microbial stimulation induces rapid CD40 ligand-independent production of interleukin 12 by dendritic cells and their redistribution to T cell areas. J. Exp. Med. 186:1819. Fernandez, N. C., A. Lozier, C. Flament, P. Ricciardi-Castagnoli, D. Bellet, M. Suter, M. Perricaudet, T. Tursz, E. Maraskovsky, L. Zitvogel. 1999. Dendritic cells directly trigger NK cell functions: cross-talk relevant in innate anti-tumor immune responses in vivo. Nat. Med. 5:405. Piccioli, D., S. Sbrana, E. Melandri, N. M. Valiante. 2002. Contact-dependent stimulation and inhibition of dendritic cells by natural killer cells. J. Exp. Med. 195:335. Gerosa, F., B. Baldani-Guerra, C. Nisii, V. Marchesini, G. Carra, G. Trinchieri. 2002. Reciprocal activating interaction between natural killer cells and dendritic cells. J. Exp. Med. 195:327. Ferlazzo, G., M. L. Tsang, L. Moretta, G. Melioli, R. M. Steinman, C. Munz. 2002. Human dendritic cells activate resting natural killer (NK) cells and are recognized via the NKp30 receptor by activated NK cells. J. Exp. Med. 195:343. Chen, S. H., K. B. Pham-Nguyen, O. Martinet, Y. Huang, W. Yang, S. N. Thung, L. Chen, R. Mittler, S. L. Woo. 2000. Rejection of disseminated metastases of colon carcinoma by synergism of IL-12 gene therapy and 4-1BB costimulation. Mol. Ther. 2:39. Pollok, K. E., Y. J. Kim, Z. Zhou, J. Hurtado, K. K. Kim, R. T. Pickard, B. S. Kwon. 1993. Inducible T cell antigen 4–1BB: analysis of expression and function. J. Immunol. 150:771. Pinto do, O. P., K. Richter, L. Carlsson. 2002. Hematopoietic progenitor/stem cells immortalized by Lhx2 generate functional hematopoietic cells in vivo. Blood 99:3939. Lutz, M. B., N. Kukutsch, A. L. Ogilvie, S. Rossner, F. Koch, N. Romani, G. Schuler. 1999. An advanced culture method for generating large quantities of highly pure dendritic cells from mouse bone marrow. J. Immunol. Methods 223:77. Pan, P. Y., Y. Zang, K. Weber, M. L. Meseck, S. H. Chen. 2002. OX40 ligation enhances primary and memory cytotoxic T lymphocyte responses in an immunotherapy for hepatic colon metastases. Mol. Ther. 6:528. Martinet, O., V. Ermekova, J. Q. Qiao, B. Sauter, J. Mandeli, L. Chen, S. H. Chen. 2000. Immunomodulatory gene therapy with interleukin 12 and 4-1BB ligand: long- term remission of liver metastases in a mouse model. J. Natl. Cancer Inst. 92:931. Miller, R. E., J. Jones, T. Le, J. Whitmore, N. Boiani, B. Gliniak, D. H. Lynch. 2002. 4-1BB-specific monoclonal antibody promotes the generation of tumor-specific immune responses by direct activation of CD8 T cells in a CD40-dependent manner. J. Immunol. 169:1792. May, K. F., Jr, L. Chen, P. Zheng, Y. Liu. 2002. Anti-4-1BB monoclonal antibody enhances rejection of large tumor burden by promoting survival but not clonal expansion of tumor-specific CD8+ T cells. Cancer Res. 62:3459. Janeway, C. A., Jr, R. Medzhitov. 2002. Innate immune recognition. Annu. Rev. Immunol. 20:197. Singh, A. K., M. T. Wilson, S. Hong, D. Olivares-Villagomez, C. Du, A. K. Stanic, S. Joyce, S. Sriram, Y. Koezuka, L. Van Kaer. 2001. Natural killer T cell activation protects mice against experimental autoimmune encephalomyelitis. J. Exp. Med. 194:1801. Wilcox, R. A., A. I. Chapoval, K. S. Gorski, M. Otsuji, T. Shin, D. B. Flies, K. Tamada, R. S. Mittler, H. Tsuchiya, D. M. Pardoll, L. Chen. 2002. Cutting edge: expression of functional CD137 receptor by dendritic cells. J. Immunol. 168:4262. Futagawa, T., H. Akiba, T. Kodama, K. Takeda, Y. Hosoda, H. Yagita, K. Okumura. 2002. Expression and function of 4-1BB and 4-1BB ligand on murine dendritic cells. Int. Immunol. 14:275. Kwon, B., H. W. Lee, B. S. Kwon. 2002. New insights into the role of 4-1BB in immune responses: beyond CD8+ T cells. Trends Immunol. 23:378. Gavin, M. A., S. R. Clarke, E. Negrou, A. Gallegos, A. Rudensky. 2002. Homeostasis and anergy of CD4+CD25+ suppressor T cells in vivo. Nat. Immunol. 3:33. McHugh, R. S., M. J. Whitters, C. A. Piccirillo, D. A. Young, E. M. Shevach, M. Collins, M. C. Byrne. 2002. CD4+CD25+ immunoregulatory T cells: gene expression analysis reveals a functional role for the glucocorticoid-induced TNF receptor. Immunity 16:311. Heinisch, I. V., I. Daigle, B. Knopfli, H. U. Simon. 2000. CD137 activation abrogates granulocyte-macrophage colony-stimulating factor-mediated anti-apoptosis in neutrophils. Eur. J. Immunol. 30:3441. Kwon, B. S., J. C. Hurtado, Z. H. Lee, K. B. Kwack, S. K. Seo, B. K. Choi, B. H. Koller, G. Wolisi, H. E. Broxmeyer, D. S. Vinay. 2002. Immune responses in 4-1BB (CD137)-deficient mice. J. Immunol. 168:5483. Huang, Q., D. Liu, P. Majewski, L. C. Schulte, J. M. Korn, R. A. Young, E. S. Lander, N. Hacohen. 2001. The plasticity of dendritic cell responses to pathogens and their components. Science 294:870. Melero, I., W. W. Shuford, S. A. Newby, A. Aruffo, J. A. Ledbetter, K. E. Hellstrom, R. S. Mittler, L. Chen. 1997. Monoclonal antibodies against the 4-1BB T-cell activation molecule eradicate established tumors. Nat. Med. 3:682. Wilcox, R. A., D. B. Flies, H. Wang, K. Tamada, A. J. Johnson, L. R. Pease, M. Rodriguez, Y. Guo, L. Chen. 2002. Impaired infiltration of tumor-specific cytolytic T cells in the absence of interferon-γ despite their normal maturation in lymphoid organs during CD137 monoclonal antibody therapy. Cancer Res. 62:4413. Wilcox, R. A., D. B. Flies, G. Zhu, A. J. Johnson, K. Tamada, A. I. Chapoval, S. E. Strome, L. R. Pease, L. Chen. 2002. Provision of antigen and CD137 signaling breaks immunological ignorance, promoting regression of poorly immunogenic tumors. J. Clin. Invest. 109:651. Xu, P., P. Gu, P. Y. Pan, Q. Li, A. I. Sato, and S. H. Chen. 2004. NK and CD8+ T cell-mediated eradication of poorly immunogenic B16–F10 melanoma by the combined action of IL-12 gene therapy and 4-1BB costimulation. Int. J. Cancer. In press.